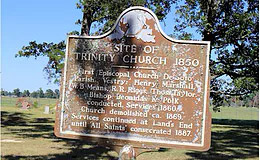 As cotton planters from Society Hill, South Carolina came West in the 1840’s for cheap land that wasn’t played out, they tended to settle near friends and relatives who came before them. And so, the town that would become Stonewall began with their plantations. They provided services like blacksmithing and sawmilling. 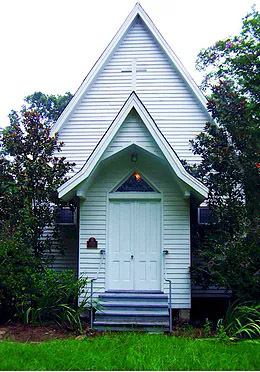 Allendale owner John Julian Marshall designed and built All Saints chapel with wood from his plantation and donations and help from his friends and neighbors. Everyone came. A school called Bee Gum was built across the road, and the plantations took turns running it. Everything changed in 1881 with the coming of the Texas & Pacific Railway. It was laid West of Hwy. 171, and the depot called Stonewall Station for General Stonewall Jackson was over there. The town and the commerce followed. The train moved at the unheard of speed of 20 mph! And the tracks were laid nearly as fast by 250 men for $1.75 a day. Telegraph lines were laid along with the track. Within a year cows from Stonewall could be shipped to the stockyards in Ft. Worth, and prefab houses made at the Sears plant in Mansfield – the largest mill in the country - were shipped to Chicago. The Nelson Brothers store in 1911 and the Ford dealership in 1926 set up across from the depot. A ticket to Shreveport was 90 cents. Like all towns during the Depression, Stonewall sank into obscurity. My mother and I went to the “new” brick school on the same bus, with the same bus driver! The completion of I-49 and North DeSoto School with its excellent reputation made people in Shreveport think about moving to the country. Today they are still building lovely new homes in subdivisions, and the town just keeps on growing. It’s a good place to live.